I'm unlikely to post anything more for the rest of the month, owing to rather more upcoming work and travel than I care to think about. So I thought I'd close the month on a positive note. Last May I promised to report on the commencement address given by Senator Ted Cruz at Hillsdale College. It was -- hands down -- absolutely the best commencement address I've ever heard, and every other professor I asked said the same thing. We desperately need many, many more people with principles and intelligence like what is shown in this address. Instead of commenting on it, I've decided to post the text here, entirely without anyone's permission. It's also available on the Hillsdale College website. Read and be inspired. Last month the world lost Baroness Thatcher, and in her honor I’d like to spend a few minutes discussing with you the miracle of freedom. Unforeseen Contingencies announces new policy! Starting today, "we" will no longer follow the "DiLorenzo redaction rule," i.e. we'll no longer redact our place of employment. This blog is entirely a personal endeavor so I've always taken pains not to list my place of employment. In the time since I started this blog, I've had multiple employers plus a good deal of independent consulting work, and out of courtesy to my employers I keep my private musings separate from the my professional work. But my places of employment have never really been a secret and I have indeed mentioned them occasionally. This policy led to the most amusing comment I've ever heard about me, from Prof. Thomas DiLorenzo, and ever since I've kept myself entertained and my readers (I do indeed seem to have readers! still!) by following the Dilorenzo redaction rule. But given what my next post will be, it's too much to keep redacting, and besides, I need some new description on my masthead. But I'm preserving the previous one here, b/c these still are among my favorite comments. Thank you, Tom! Thank you, Walter! 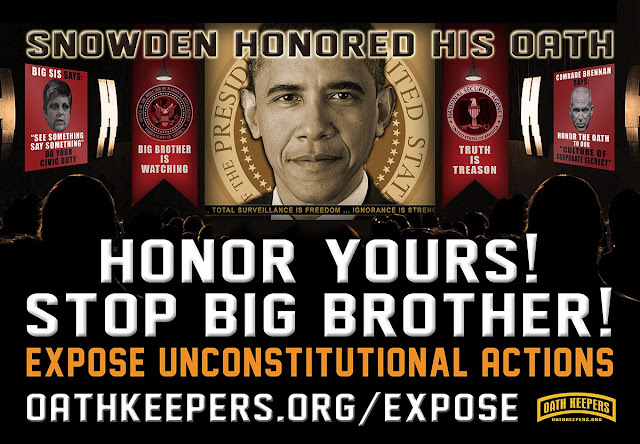 Oath Keepers billboard in the DC metro. Unforeseen Contingencies gives this "our" full endorsement! That's the charitable explanation. After rodeo clown Tuffy Gessling wore an Obama mask at the Missouri State Fair Rodeo, NAACP has demanded that the Secret Service investigate this "threat" to Obama's safety, and that DoJ pursue a "hate crime" investigation. According to NAACP, a rodeo clown wearing a mask constitutes a serious threat of violence against the president. Either those who make up the NAACP leadership are astoundingly stupid, or -- the more likely explanation -- they are quite evil and vicious. My guess is that it is that latter. This is an example of the leftists posturing as anti-racists in order to destroy anyone and anything that challenges their rule, no matter how slightly. Note that these liars claim it would be an outrage even if the president were "black, white, Hispanic, Latina*.." Oh, really? Then where were they when Bush 43 was repeatedly mocked and insulted by mask wearers? Or for that matter, when a rodeo clown used a George H.W. Bush dummy as a target to distract a bull. NAACP was silent. What falsehoods? Clearly Obama is a supporter of the Muslim Brotherhood. Obama has certainly assaulted our freedom like no other president in history, and is pushing us towards a genuine dictatorship and police state. Is Obama a Muslim? Who knows? The rancher posits this as a belief, not an established fact... and it's hardly one that has no supporting evidence. But WaPo concludes it must simply be that any criticism of Obama is evidence of racism. The intellectual bankruptcy and dishonesty of the left -- as exhibited by NAACP and WaPo in this instance -- seems to know no bounds. Mocking Obama is inherently racist, unlike mocking Reagan, Bush 41, Bush 43, or Romney. Obama masks, unlike Reagan masks, Bush 41 masks, Bush 43 masks, Romney masks, etc. are inherently racist. Never mind that Obama himself finds Obama masks amusing. * (if "he" were "Latina?" Maybe they really are mentally challenged). I've been extremely busy with a variety of things, and blogging is rather low on the list at this point. I ran the Elkhorn 50K (best ultrarunning performance I've had in years, I believe it was my second best time at this distance ever, and on the second toughest course I've ever run, no less). I've also attended a reunion of cousins on my mother's side (really quite enjoyable, included encounters with bears and single malt scotch), traveled with Johanna and my mom to Glacier Park (encounters with martinis and various wild animals, esp. Chaos) and also been working like a maniac trying to get ready for fall classes and finish a paper or two...plus miscellaneous activities. I hope to get back into regular blogging action in September, and will try to get in an occasional post in the interrm.